DALLAS – D Magazine has selected Sayles Werbner shareholder Rob Sayles to the 2018 edition of Best Lawyers Under 40, a list that recognizes outstanding young attorneys in North Texas. Sayles represents plaintiffs and defendants in a wide range of litigation, including commercial disputes, product liability, personal injury and wrongful death claims. His success record in 2017 includes obtaining a summary judgment on a covenant not to compete claim where his client faced more than $3.6 million in damages and negotiating significant settlements on behalf of clients injured in car accidents. He also defended the City of Dallas in several lawsuits filed by firefighters and police officers claiming billions of dollars in back pay. 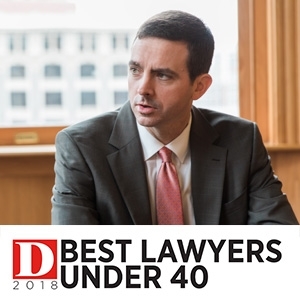 Sayles is among 135 attorneys included in the Best Lawyers Under 40 list, which is selected from peer nominations and a review by a blue-ribbon panel of lawyers and D Magazine editors. The full list is available in the January issue of D Magazine. In addition to the D Magazine recognition, Sayles has been featured on the Texas Super Lawyers Rising Stars list annually since 2012. He was also honored in the 2017 edition of D Magazine’s Best Lawyers in Dallas for representation of clients in business and commercial litigation. He is a graduate of the Southern Methodist University Dedman School of Law and the University of Texas at Austin.